As a preemie mom, there is a tiny part of me that feels like the joy of Jossie's birth was stolen from me. When she took her first breath and made her first cry, I felt hopeless. I felt like I had failed her. But in that moment of my life, I was never aware of the unexpected, new joys I would feel because of her early birth. I saw daily the love and gentle care of the NICU nurses and doctors. I was overwhelmed with the support from my family and friends, whom I knew were always there for me but, man, they were REALLY there for me. I experienced Jeremy's and my marriage grow because of this new challenge. And, practically speaking, spending three weeks in the NICU forced me to stop, sit and enjoy my newborn. If we had been at home, I know me, and I would have been still moving a mile a minute, taking care of Jack, the baby and the home. But the NICU time forced me to sit with my girl and kangaroo care the bejeebers out of her, and I'm grateful for that quiet bonding time. I'll never forget the tears of joy at Jossie's 5-month check-up at the pediatrician when we learned she was on the growth chart for her actual age. Or watching her as a toddler, "reading" books and crossing her arms over her chubby belly when she gets fed up at Jack. Today, my family experienced a lot of joy. 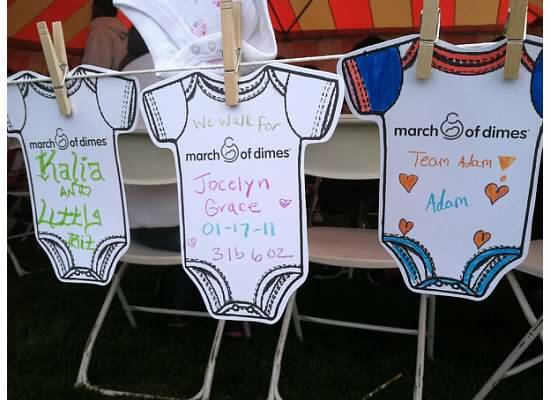 We participated in our first-ever charity walk - the March for Babies walk. 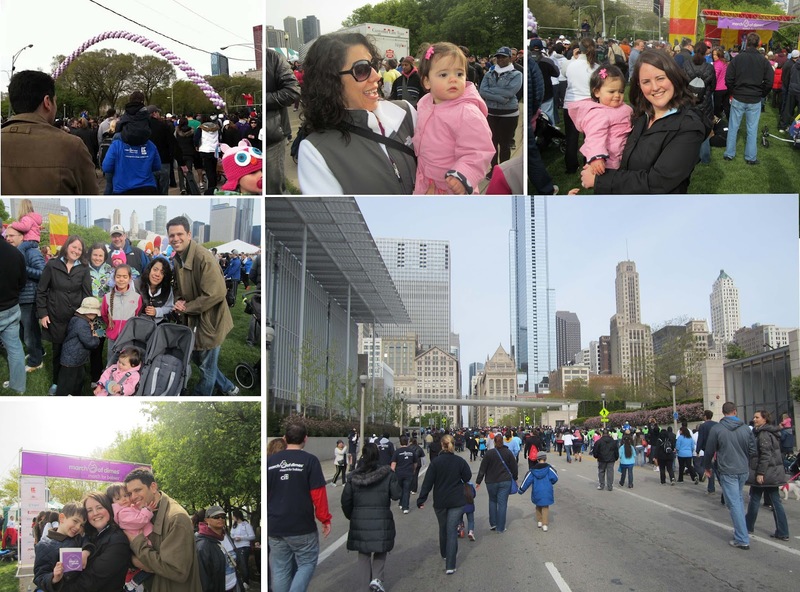 A few of our dearest Chicago friends walked with us, and we were overjoyed with our friends' and family's generosity, helping us to raise more than $1,000 for the March of Dimes. I'm a professional fundraiser, and this is the best money I've ever raised. I'm thankful for my healthy babies as I saw families walking in memory of the little ones who didn't survive. And I was really impressed with the family who was walking in honor of their little one, born at 25 weeks this past February and thriving. They had their act together! It was a privilege and honor to participate in today's walk, walking alongside thousands of other March of Dimes supporters. Thank you again for your love and support. Yesterday, I received an email from one of my vendors at work - a port-o-potty company - inviting me to like them on the Facebook. It's pretty safe to say that the glamour of the previous weekend has receded and my normal life is firmly back in place. This week was crazy-pants. Meeting after meeting at work - I hate operating that way. I need a little space to organize and plan. I am not good at working on the fly. At home, I'm volunteering for Jack's preschool teachers' appreciation lunch; we're prepping for tomorrow's March of Dimes walk; and Jossie had her 15-month pediatrician appointment yesterday (25% for weigh and 50% for height - actual age, baby!). Friday night was a welcomed respite - met with my besties for dinner. We first tried for the hip Ruxbin. Ruxbin does not take reservations and people line up at 5:30 p.m. to put their name on the list. I tried in vain, and I got a estimated time of 8:45 p.m. for our party of 3. This is too late for us mama girls, so we implemented a very nice plan B - a quiet dinner at West Town Tavern. It's one of my neighborhood favorites - a gracious atmosphere, seasonal dishes and well-priced glasses of wine. This morning I managed a feat - while Jeremy took Jack out to run errands and Jossie girl napped, I took a lavender-scented bath - with candles, my new bath pillow and music . This was in between less-pampering activities like laundry and cleaning Roscoe's litter box, but any down moment is a good moment for this mama. I'm grateful for the busy hum of Jeremy's and my family life, despite how tiring and chaotic it can be. I know someday I'll look back on these innocent early days - my toddler girl clinging to me at the pediatrician's office; my husband taking my preschooler for a junior baseball mitt for his first MLB game Tuesday night; and me planning yet another grocery list for the week ahead. It may not always be enchanting, but this life is mine. And thank you for everyone who is supporting our walk tomorrow. We are overwhelmed with your generosity. Thank you. 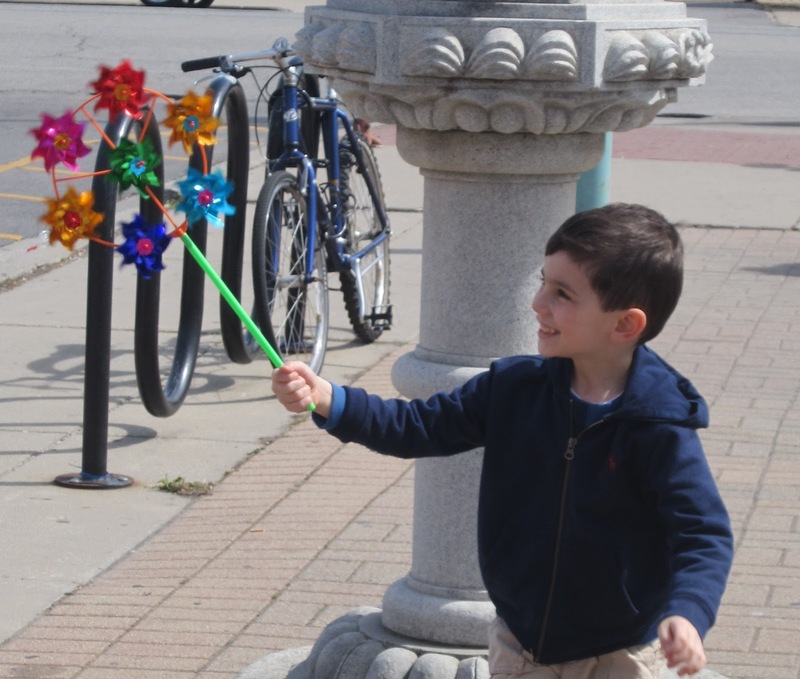 Gentle readers, this weekend is the March for Babies walk in Chicago. Please help us to say thanks for the good care Jossie received as a preemie by making a gift of $5, $10, or $25 to our team. I'm thinking it will be pretty easy to hit our goal for Jack and Jossie - we're raising money for cute babies, for goodness sake. Next up, we'll be fundraising for puppies and rainbows. And I'm bringing out the big guns. Oh, honey, and I'm not done yet. Let's read Jossie's birth story too. As our plane neared LaGuardia Airport Thursday night, I held up both of my hands for Jack. I explained to him that every day has something special about it, but there are those few days that are extra special. Days like his sister's and cousins' births. Days that you can count on two hands. "Aunt Cassie is getting married, Jack," I told him as Jossie stood on my lap, reaching her chubby hands toward the passengers seated behind us. "This Saturday is going to be one of those extra special days we'll always remember." This weekend was a dream. My sister-in-law Cassie and my in-laws orchestrated a perfect affair for Cassie and Daniel's wedding. No detail was overlooked. My own parents joined us, and I loved showing them New York, the city I've grown to love. We walked Central Park, taking in the sights and sounds on Friday afternoon. A rehearsal dinner at Fred's Friday night, complete with toasts, a slideshow of the bride and groom and lots of laughter. Jeremy's immediate family is small - but what they lack in cousins they make up for in wonderfully loving family friends. They are loud, faithful and supportive. Whoops and hollers went up as I gave my toast, giving Daniel the groom some advice on marrying into the family I too married into seven years ago. I spend most of Saturday gasping at the pretty things that surrounded us. 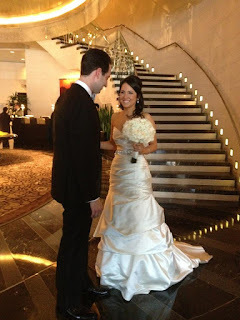 The wedding was at the Mandarin Oriental, and I beheld the exquisite beauty of the hotel - the lobby, the bridal suite and Jeremy's and my guest room, to name a few. We spent the afternoon getting ready in the bridal suite with a team of people doing our hair and make-up. Jossie was with the babysitter while Jeremy and Jack sat in the bridal suite with us - Jeremy editing his toast while Jack oblivious to all of the activity, played on my iPhone. This being a Jewish wedding, the bride and groom saw each other before the wedding during a reveal. Cassie and Daniel are meant to be together - so perfect for one another. I felt like my heart might burst from my chest when they saw each other for the first time - so loving, so enchanted with each other, so giddy. I'll never forget seeing the room where the ceremony was held. Cassie and my mother-in-law Ellen were getting their picture taken by the photographer. They looked stunning, and the room equally so. Elegant branches framed the chuppah; white flowers placed everywhere; and candles floated in tall, slender vases, filled with water, along the aisle. The reception following was probably one of my favorite parts. 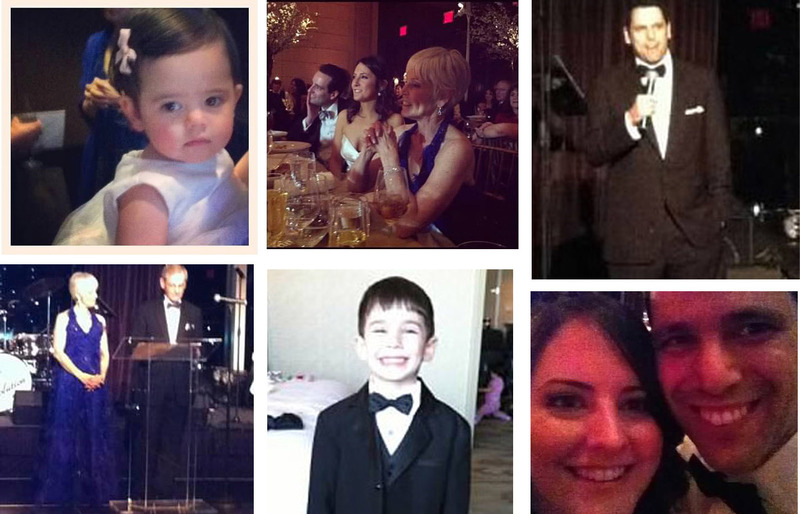 Jack, in his little tuxedo, held my hand and asked me to order him a "cocktail" - ginger ale and cranberry juice. We staked claim to a table in the corner of the room and Jeremy brought us a plate of seafood, dumplings and sliced steak. Jack, sipping his cocktail and lounging in his tux, looked out the window at Central Park from our 36th-floor vantage point. "I could stay here forever," he said. Me too, babes. Jack was escorted upstairs after the reception to the nicest, most pleasant babysitter in all of New York. She handled the kids well, leaving Jeremy and me to enjoy ourselves. The evening was love, glasses of sparkling wine and fun. No slow dances - just lots of energy and friendship. At 12:30 a.m., I couldn't believe the wedding was winding down. And in reality, it wasn't. The doors opened to another room, where there was an after-party for the late-night revelers. There was comfort food - grilled cheese, pigs in a blanket and sliders for late-night snacking. There was a DJ, club lights and spectacular views of the city. Late into the night, Jeremy and I went to our darkened guest room to relieve the babysitter and kiss our sleeping babies. I pulled open the heavy curtains, and Jeremy and I sat on the couch, looking at the twinkling lights of the city. 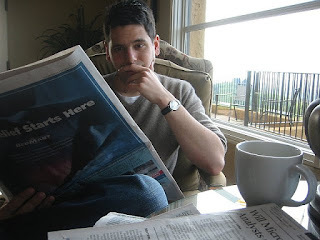 Seven years and two kids later, Jeremy and I are well entrenched in the "happily ever after" part of wedded bliss, and it's always a treat to reflect back on how far we've come since our own wedding day. Weddings are special. Family weddings are even that more precious. The older I get and the more married I get, the more I value a wedding day. This day was enchanting, poignant and thoughtful. I'm so glad my own parents were included in the celebration and for the love that surrounded the couple. We're home now and everything is a memory. Hoping the love and joy of the wedding will surround Cassie and Daniel for all of their days. My husband is so lucky. He has me as his personal life coach. I am always there with helpful hints on how he might improve our condo, our finances, our marriage, his career and fatherhood. If he needs a haircut, I am there to remind him. If there are bills to be paid, I'm there to tell him. Kitchen trash desperately needs to be taken out? Don't worry; I'll ask Jeremy. In fact, just this morning, I gave a beautiful soliloquy on putting his best foot forward, consciously living the best life he can. I am glad I married a patient man. Tonight, I came home from an after-hours meeting at work, having had two glasses a wine and a plate of charcuterie. I flopped down on the couch and turned the Glee on. Jack sat next to me and cuddled. After a few minutes, I told Jack it was time for bed, and I promised I would be 100% again in the morning for him because I certainly was not exhibiting my "best life lived" at that moment. "You're 100% now, Jenn," Jeremy said, walking past the couch. "It just happens you typically operate at 150%." Mind you, I'm no slouch in the married department - I can bake, I birth babies and I ensure there are stacks of toilet paper in each bathroom. But Jeremy will always best me at modeling patience for our kids and for me. While I can get my undies in a bunch about the small stuff, Jeremy has his eyes trained on our larger goals. This is the balance we maintain. And for that I am grateful. My favorite picture of Jeremy. We were on vacation, pre-Jack. More reflections to come on marriage as we near the much-anticipated wedding day of Jeremy's sister and her beloved. All weekend, my thoughts have been in two places: Here and There. We made a conscience decision to not go There for Easter - my parents' house in Cleveland. As much as we knew we would miss my mom's meals, the cousins playing together and my dad reading to the kids, we're traveling again in a few weeks and it's getting harder to travel with two (though I remain proud at the efficiency in which Jeremy and I bring to an airline security line with two kids, two laptops, a double-stroller, four pairs of shoes and coats and so on). So we decided to stay home. Here. And it helped that my mom visited last weekend for some Jack and Jossie cuddles too. So Here we were - my first Easter not at my parents' house in about a dozen years. And - to boot - it was Passover as well. So in our glass-is-half-full perspective, it was time for Jeremy and me to start making some family traditions of our own for the brown-eyed babies. 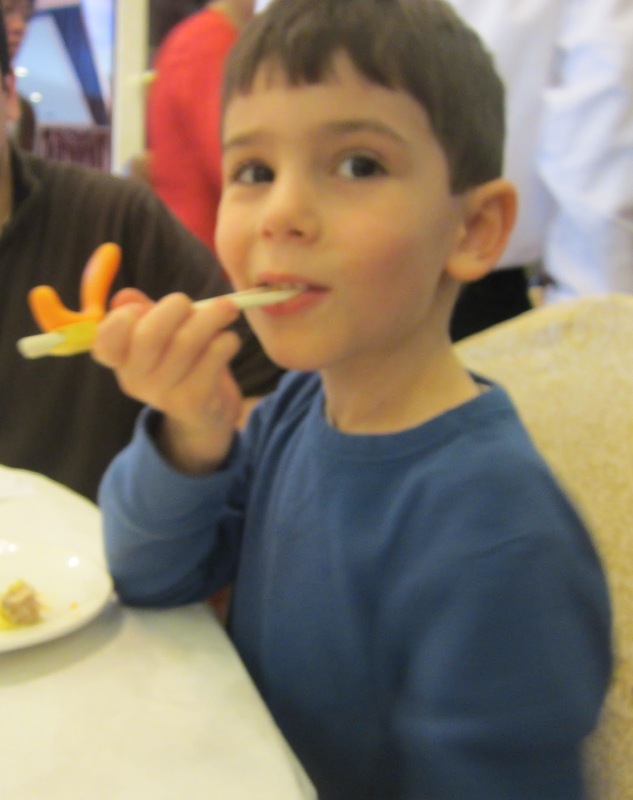 We're lucky that our kids aren't picky eaters and tried all of the dumplings. It was a beautiful day as we left the restaurant. We took in the afternoon walking around Chinatown with the kiddos and then came home for naps. Saturday night was our four-person Seder. Jeremy did his best Seder ever, taking it slowly and explaining the symbols to Jack. Jack probably got about 5 percent of the Seder and that's okay. With time and repeated ritual, will also come understanding. An Easter egg on the Seder plate because that's how we roll. And Sunday morning was nicer than I had expected. I tried in earnest to not get too crazy with the Easter baskets and it went over well - a small toy, a book and candy for Jack and Jossie each. Who doesn't have this picture from growing up? Okay, maybe not with the Yoda Easter basket. Jack and I went to church. I've never been to a major holiday at my big-city church and there were lines out the door. I went with Jack to the children's service, held in the church cafeteria. We were joined by one of his day school friends. The leader told the Easter story by using differently colored pieces of paper. If a child had a particular color under his/her chair, they were to go stand by the leader. Not all children had a piece of paper, and when the leader called for the color blue, our charismatic Jack announced loudly, "Well, I'm wearing blue." And before I could say anything, he was standing by the leader. Other children caught wind of this notion, and soon half the room was standing at the front. That's my Jack - he can convince you of anything. Jack and his buddy were restless. Jack probably got about 5 percent of the service and that's okay. With time and repeated ritual, will also come understanding. Jeremy and Jossie picked us up for brunch at Ina's, one of our favorites, and I was geeked out to be seated at Ina's table in the back, where I promptly ordered a vanilla bean latte as a treat. And in the afternoon, after Jack's tennis class, we spent time at the Chicago Botanic Garden, enjoying the warm weather, the blooms and each other. So all in all? A good weekend. Jeremy and I did it - two holidays and two happy kids. Happy week ahead, gentle readers! Jack stated the other day, "Boys like fire stations; girls like princesses; and parents like computers." And so I thought it might be a good idea to take a break from the laptop and iPad for a few days while at home. Jossie is teething too, and it ain't pretty. I spend much of my evenings holding her, nursing her and trying to comfort my little brown-eyed baby. This often extends through the night, and I've been dragging myself to work this week. Preheat the oven to 375. Prepare a 12-muffin tin by spraying with cooking spray. Sift the flour, poppy seeds, baking soda, baking powder and salt together. In a separate large bowl, beat the butter and sugar together with an electric mixer on high speed until light and fluffy. Add the eggs one at a time, scraping down the bowl and mixing well after each addition. Combine the buttermilk, lemon zest and juice and vanilla. Add to the egg mixture, alternating the flour mixture and stir just until no flour is visible. Do not overmix. Scoop the batter in the muffin cups using an ice cream scoop . Bake 20 to 25 minutes and enjoy! These muffins hold up extremely well, stored in an airtight container on the counter. On day 2 or 3, slice the muffin in half and toast in the toaster oven. It's heavenly! I was about to wish you a happy weekend but it's only Wednesday. Soldier on, gentle readers.